As before, Mercedes also included an attractive Cabriolet version of the 300SE which had a fully lined convertible roof. Like the saloons and Coupe the Cabriolet was well equipped and built to the highest standards. 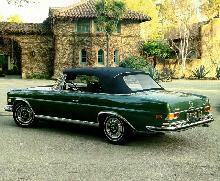 Production of the 300SE Coupe and Cabriolet continued until 1968.